The big news that seems to have come from our match against Plymouth on Saturday was the seven-minute delay in kicking off because of the GPS tracking devices that we have started wearing. Both teams were left in limbo out on the pitch while our secretary and sports scientist scrambled into the office to get a print-out of the confirmation email from the Football League to allow us to wear the trackers. I can understand that player safety has to be of paramount importance, but the reason that they are so easy to spot in between the shoulder blades is because of the amount of padding on the vests that we wear. Some of the lads are very particular about what they do and don't wear on a matchday so took more than a little persuading to wear the vests under their shirts. But we have them on in training every day so it didn't take too long to get used to them. The devices track our every move on the pitch. They can tell you loads about our performances, including how far we have run, how many sprints we do and how heavy the workload has been on our bodies. I'm always open to new ideas and the advances in technology that can aid us. We have been assured by our sports science department that they aren't just turning into Big Brother, and that the data they would get back from the tracking would be invaluable to them. They give us feedback after every game and they also use this data to help in training preparation, allowing them to recreate the number of sprints and distance covered in games in our training sessions to make sure we are up to speed. If someone's stats drop significantly over a course of games they might be fatigued and open to injury so they can be given extra rest. Or it might be decided that someone isn't fit enough so is given extra work to do. "Following FIFA's decision to permit players to wear Electronic Performance and Tracking System devices under the laws of the game, The Football League has also sanctioned their use in its competitions. "Clubs were notified of this rule change in writing before the start of the current season and the matter was explained to club managers at their annual pre-season meetings. "Any club seeking to use EPTS devices is required to notify the League and provide relevant details relating to how they will be worn and used. 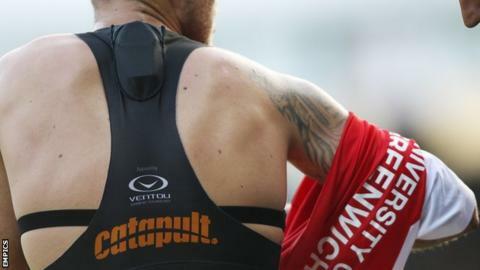 To date, 19 clubs, including Wycombe Wanderers, have registered their intention to use these devices." Every footballer is different and some of the lads pay more attention to the information given to us than others. Some lads are really interested in the feedback and check their stats first thing every Monday morning, while some aren't so interested and will only deal with the stats when told to. And then there are the lads who pretend not to care but still check when no-one is looking! I'm fascinated by it all so I'm always asking for feedback and information about what I should be able to do and how far I should be running. It's all part of the competitive edge needed to build a career for yourself. A club of our size obviously doesn't have the money to spend on extravagances such as GPS tracking devices, so we have been extremely lucky to have been able to loan them from a sports fitness company. In return they are allowed to use our data for their own use and development. I'm sure that the technological advances will continue and I will always embrace them while always trying to gain that edge.